From 22. June - 15. 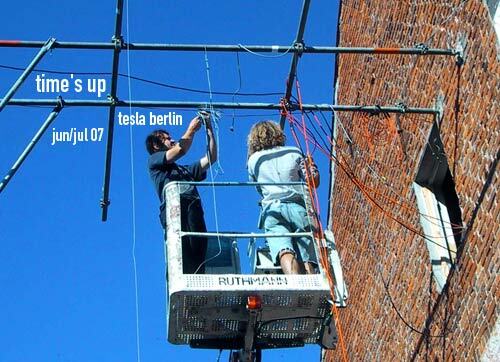 July the Linz (Austria) based time’s up - Laboratory for the construction of experimental Situations - will move their sensory development camp to Berlins TESLA. In cooperation with tesla garage will produce a month full of open-air sensory action, workshops, performances and talks. More information soon. This entry was posted on Friday, February 16th, 2007 at 7:02 pm	and is filed under Berlin activities. You can follow any responses to this entry through the RSS 2.0 feed. You can leave a response, or trackback from your own site.